Be one of the first to fill your garden with this exciting new Starburst Dahlia. 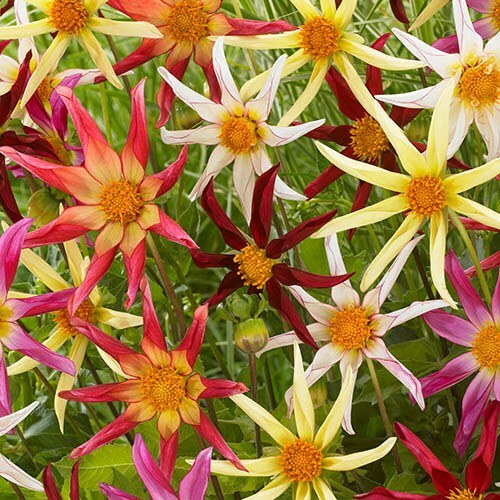 A striking new introduction with unusual star-shaped, starburst blooms, this mixture of spiky-flowered 'Honka' dahlias is very rare and not widely available. It's taken 2 years of intensive work at the growers for the stock to be produced for us and we're really pleased to be able to bring this premium range of Starburst Dahlias to you. Also known as Cartwheel, Star or Orchid Dahlias because of the unusual, wheel-shaped flowers, ‘Honka’ dahlias are a real delight for lovers of something a little more unusual. Blooming from midsummer right up until the first frosts, the flowers make a cheerful addition to the border or patio pots, plus their sturdy, upright stems make them ideal as a cut flower for your flower arrangements. We supply 5 x top quality tubers in a mixture of colours ready to be potted on. It's taken 2 years of intensive work at the growers for the mix of 'Honka Starburst' to be produced for us and we're really pleased to be able to bring this premium range to you, the home gardener - this is your opportunity to get your hands on the next big thing in dahlias before anyone else! Also known as Cartwheel, Star or Orchid Dahlias because of the unusual, wheel-shaped flowers, they're a real delight for lovers of something a little more unusual. Blooming from midsummer right up until the first frosts, the flowerheads have a single ring of curved outer petals surrounding the central disc and make a cheerful addition to the border or patio pots, plus their sturdy, upright stems make them ideal as a cut flower for your flower arrangements. Growing to a height of around 60cm, we supply 5 x top quality tubers in a mixture of colours ready for potting-up or planting out once all risk of frost has passed. When the plants flower, you will notice one large central bud and two, smaller side buds. You can either remove the side buds to get one large flower or keep them to get three flowers which will be smaller. Dahlias are fairly hardy, although frost-tender perennials and during mild winters they will overwinter successfully under a heavy mulch. However, we do recommend where possible that tubers are lifted in the autumn and dried upside down before storing in a frost-free place over the winter. Stored tubers can then be started back into growth the following spring before planting back out.